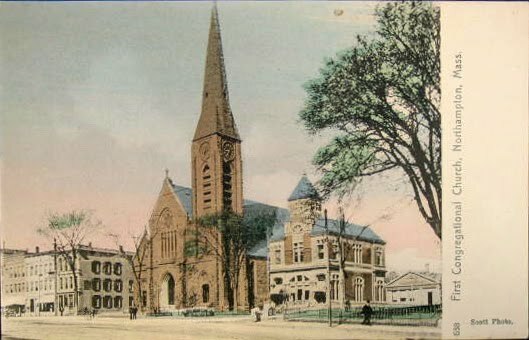 The history of First Churches is as old as the history of Northampton. There have been five Meetinghouses since the First Meetinghouse for The First Church of Christ in Northampton was built in 1654, the year Northampton was settled by English Puritans. Pastor Jonathan Edwards, known as one of the greatest and most profound American theologians and revivalists, preached in the Second Meetinghouse. The Third Meetinghouse was built during the period of Edwards’ “Great Awakening”. This building was able to accommodate the rapidly increasing congregation and the number of people flocking to Northampton (in 1737). The “stepping stone”, a large rounded flagstone that graces the main entrance to the current building, is original to the Jonathan Edwards Third Meetinghouse. The Fourth Meetinghouse, “the Old Church”. Responding to an ever increasing need for a larger building, theFourth Meetinghouse was completed in 1812. Designed by Asher Benjamin, the building became one of the finest examples of church architecture in New England and gradually became known as “The Old Church”. After the Fourth Meetinghouse was destroyed by a severe fire in 1876, L. Clark Seelye, Smith College President and First Church Trustee, led the building of the Fifth Meetinghouse. The Boston architectural firm of Peabody and Stearns (which had just completed College Hall for Smith College) was hired to design the new building. The Fifth Meetinghouse, built in 1878, appears on the National Registry within the Downtown Northampton Historic District and sits on what has traditionally been called “Meetinghouse Hill”. An integral part of Northampton’s history, the Meetinghouse is noted with a historic kiosk as a major point of interest on Historic Northampton’s Walking Tour. In the spring of 1988, The First Church of Christ in Northampton and the First Baptist Church of Northampton joined to become one church family, believing they could better serve the community by combining resources. From that time onward, they have been known as “The First Churches”. Like the original structure built in 1654, the current First Churches Meetinghouse has been used for worship and community gathering. These two functions remain the primary focus of First Churches and the Fifth Meetinghouse, a fully handicapped accessible building, has become a unique space used for multi-faith worship, public forums and cultural events, and human service outreach. The Meetinghouse historically acted as a building open to use by all, and although Northampton is no longer a town with a common central religion, First Churches has worked hard to uphold the original intent of those who constructed the Meetinghouses over a period of 350 years. The Fifth Meetinghouse on the north side of Northampton’s Main Street was conceived in the urban environment of the 1870’s. Its simple yet dominating tower, deep brown stone, and firm clean lines reflect the Beaux Arts eclecticism of the High Victorian era; the Peabody and Stearns building also states the American emphasis on craftsmanship and materials – simplified yet dignified. The 19th century builders who constructed the Meetinghouse used mainly materials indigenous to Western Massachusetts, most notably the Longmeadow brownstone that gives it its distinctive color. The exterior of the building is constructed entirely of stone with a slate roof. The foundations are granite and above the watertable the walls are the Longmeadow brownstone. The tower and spire are built entirely of stone. A continuation of the aesthetic of the exterior, the interior reflects the Victorian demand for craftsmanship and beauty. When entering the sanctuary from Main Street, the warmth of the whole building is expressed by space and light; the many colors of light reflected in the stained glass windows and the warm beauty of the cherry wood pews. Ten iron columns, manufactured by the Healy Iron Works of Brooklyn, New York, support the roof. From the top of each column rises a wooden pillar which supports the side arches. The ceiling is finished in spandrels and arches, with heavy cross beams extending from side to side. Gothic arches springing from the top of the iron columns extend to the outer walls. Arches are carried from column to column the length of the building. The sanctuary floor is “bowled” rising two feet from the pulpit to the vestibule. The pews curve as they approach the pulpit. It is estimated that 1000 people can be seated in the sanctuary. 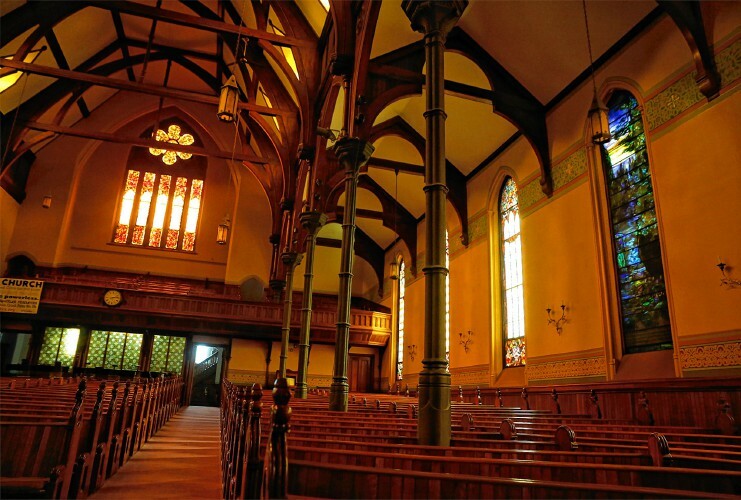 The many large colored glass windows are made of leaded colored cathedral glass that was furnished by Kelly and Holland of Boston. All are of elaborate design. Two memorial windows stand opposite each other on the east and west walls. On the west wall is the window called “The stream of Life” (1899) and is signed by Louis Comfort Tiffany. The other window, attributed to Tiffany’s workshop, is titled “Noli Me Tangere”. The organ, built by Ernest M. Skinner, one of the leading organ builders in the United States, was presented to the congregation at the time of the congregation’s 275th anniversary. The organ is situated directly back of the pulpit and presents a full front of displayed decorated pipes. The clockworks, owned and maintained by the city of Northampton, are an excellent 19th century artifact. Built by E. Howard and Co. of Boston, enameled in green and gold and weighing 1,600 pounds, they sit in a glass case below the steeple and include the original directions for the care and maintenance of the clock.